Though I have never heard of these games, today we have the Goodwill Games which Mason noted are the most prestigious international multi-sport invitational in the world, where athletes come together to put their greatness to the test. The Goodwill Games invite only the best. Athletes are invited based on rankings and performances in major international competitions including Olympic Games, World Championships and past Goodwill Games. The flag (logo placed on white background) has white continents, blue oceans, green ears, and a red star. Quoted by Rob Raeside, 19 February 2004. 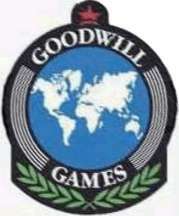 The Goodwill Games were an international sports competition, created by Ted Turner in 1986 in reaction to the political troubles around the Moscow 1980 (the American-lead boycott for the Soviet invasion to Afghanistan in 1979) and Soviet retaliation boycott to Los Angeles 1984 Olympics. The first edition was held in Moscow in 1986, the second was in Seattle in 1990, the third was held in St. Petersburg in 1994, the fourth was in New York in 1998 and the fifth and last edition to celebrated was in 2001 at Brisbane, Australia. "Color -- The three colors--red, white and blue--represent the colors included in the the flags of Russia and the United States." "Star -- Both countries traditionally have used stars as their symbols: the famous red star of the Soviet Union/Russia and the 50 stars in the U.S. flag. For the first Goodwill Games in Moscow in 1986, the logo star was solid red. Revised for the 1990 Games, the star is.....blue, white and red." "Globe -- The line art of the earth represents the global nature of the competitive field as well as the Games' intent to unite the athletes and countries of the world." "Five lines -- The five thin lines on the right and left sides of the globe represent the five continents." "Laurel leaves -- In ancient times a laurel wreath was presented to winners of athletic events and has long been associated with sports competitions. Additionally, laurel leaves are associated with the ideals of peace, honor and glory." 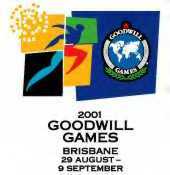 The Goodwill Games Ceremonial Flag consisted of the Goodwill Games Logo on a white field. The flag was proportioned 1:2. The star was a solid red. The cyrillic letters for Moscow '86 curved above the globe in navy blue. The continents were light blue on a navy blue globe. The five lines on each side of the globe were gold. The cyrillic letters for Goodwill Games curved below the globe in navy blue. Beneath these letters were two curved gold laurel branches. The flag was raised to the strains of a special Goodwill Games fanfare. The second Goodwill Games did not have a ceremonial flag. But two hand held flags were used to lead the parade of nations during the welcoming ceremony. These flags had two distinct designs. The first flag consisted of the Seattle '90 Goodwill Games Logo on a white field. This logo was very similar to the Moscow '86 Logo but with a few changes. The star was blue, red, white and red (from the top). Beneath the star "Seattle '90" curved above the globe in red. The globe was now bright blue with white continents. The five lines on each side of the globe were blue. "Goodwill Games" curved below the globe in red. The two curved laurel branches were blue. Flag displayed the Seattle 1990 Goodwill Games Welcoming Ceremony Logo on a white field. This logo consisted of a green field surrounded by flowing and intertwining red and blue ribbons. On the green field were the following gold letters: SEATTLE 1990 GOODWILL GAMES WELCOMING CEREMONY. 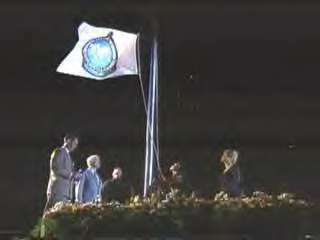 The 1994 Goodwill Games Ceremonial Flag consisted of the games logo on a white field. The flag was proportioned 1:2. The logo was essentially identical to the 1990 logo except for the name and date. The cyrillic letters for St. Petersburg '94 replaced Seattle '90 in red. Also Goodwill Games appeared in red cyrillic letters instead of english. A beautiful, specially writted Goodwill Games Hymn was performed during the raising and lowering of this flag. A ceremonial flag was lowered during the closing celebration of these games. This flag consisted of the New York City '98 Goodwill Games Logo on a white field. This logo was changed a lot from the 1990/94 logo. A black backround was added to the logo. The star was all red except for the white strip. New York City '98 curved above the globe in white. The globe was blue with white continents. The five lines beside the globe were white. Goodwill Games curved below the globe in white. The curved laurel branches were green. A second version of this logo also appeared. This logo was identical except for the text. Goodwill replaced New York City '98 above the globe, and Games remained below the globe. This logo was used at all subsequent games. The Lake Placid Winter Goodwill Games designed a completely different logo pictured here. No ceremonial flag was used as far as I know. Brisbane's logo is pictured here. No ceremonial flag was used that I know of.